When you put stems of real or artificial flowers, or the wires from gumpaste flowers into a cake, you need to be careful for a couple of reasons. First, just randomly sticking something into the cake can ruin the icing or fondant, so pushing stems in can end up making a mess or crush the cake itself. If the cake is cold it will be harder to push the stems in, and that can result in additional damage. To minimize damage to the surface of the cake, use a wooden skewer to create a pilot hole, so to speak, then insert the stem into that hole. 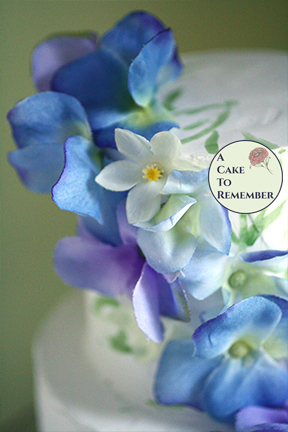 It will prevent the fondant or buttercream surface from being punctured in an irregular way when the flower goes in. Second, when you put things into a cake you need to make sure that it's food-safe and won't end up being cut off and bitten into by a customer. I've heard of people who have cut into wires and unknowingly served pieces of the cake with wire in it to people. So when you insert anything into a cake, you want to make sure that anything that's not food-safe is encased in something that's fine to touch food. Putting the stem into a drinking straw, a coffee stirrer, or dipping it into food grade beeswax is one way to create a barrier.